I love working with my hands. It’s one of the ways I fold loving energy into the doings of my day, and it helps me connect with life in a more tangible, intimate way. It also calms me down, helps center my mind, and relieves stress, making me happier! This article has a lot more to say about the beauty of busy hands. There’s a lot to be said for making something, in being a part of a small but wondrous transformation that turns a thing into something else entirely. It’s as close to making magic that I know of, and it illuminates my spirit. And then there’s beauty, for making things more beautiful than they have to be is such a delight and supreme pleasure. 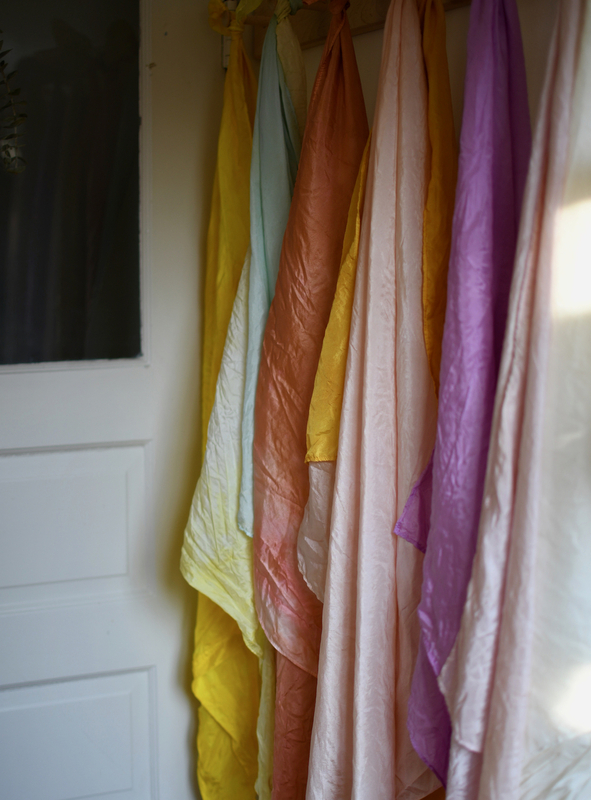 Here’s how I made one of my more recent projects: plant dyed play silks. They are one of our favorite open-ended toys here at home, as they are full of imaginative possibilities for little ones. You can use them as capes, crowns, forts, streams, in villages, or anything really, as they are quite fluid and open to many creative paths. We love play silks, and get most of ours here, but I always wondered what it would be like to dye our own. 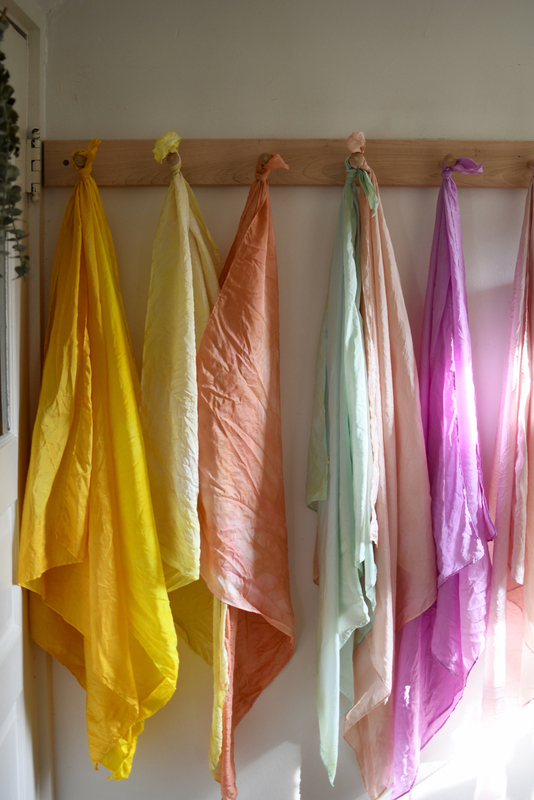 I love the soft, earthy hues that natural dyes gives nature fibers and fabric, and given that the silks are indeed made of silk, they took very well to these beautiful plant dyes. And what an experiment it was! I learned so much along the way and cannot wait to apply these dyeing methods to various projects from here on out! While this process is quite simple, it’s also very varied. By this, I mean that your silks are not going to look like mine. They are going to look like your silks, because there are about a thousand and one ways to get a desired outcome. So be patient with yourself and try and view this project for what it is, a grand experiment that will result in some bright and silky magical play things! Make Your Dye: Add as much plant matter as you want to a large pot of water with a cup of white vinegar. Vinegar will help the dye set. 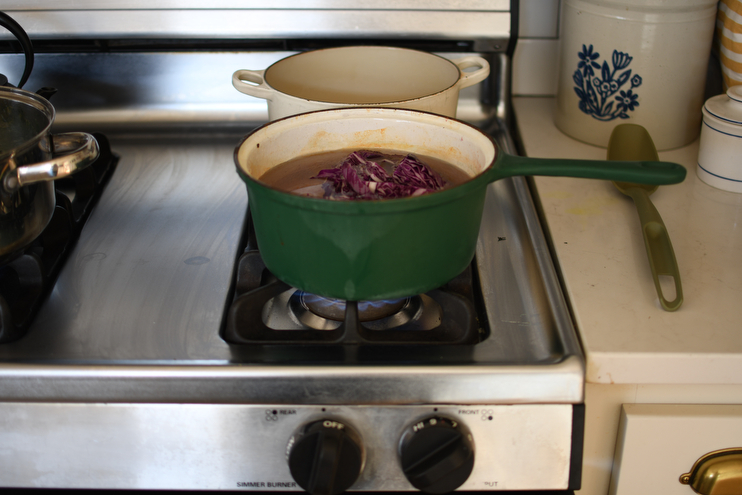 Bring the water to a boil and then reduce the heat, letting the plant matter break down into the water, thereby changing its color. You can do this for 30 minutes, or 3 hours. It’s totally up to you, and just depends on the vibrancy you are looking for. Scoop some water into a glass jar every now and then to see where the color is at, and either let it keep stewing, or decide it’s done if it looks right to you. Strain: Once your dye looks good, strain the plant matter from the water and pour the dye into a large mason jar. This liquid will be hot, so be careful, then compost the leftover plants! Dye The Silk: Add one (or two) white play silks to each jar, and let them sit for at least an hour to absorb the dye. You can move them around with a spoon, keep them in there overnight, and even do multiple dunks in different dyes to get a range of colors. It’s totally up to you. Again, this process is one you can personalize. Rinse & Dry: When your silk has reached the desired color you are wanting, take it out of the dye and rinse it in cold water until the water runs completely clear. Hang dry out of the sunshine, as it will fade the color, and give to the kiddos once dried! What a fun project! I think I’ll put this on our summer project list. I really love the muted colors of the natural dyes. So pretty. These are beautiful! How much powder do you typically use (turmeric & chlorophyll) and where did you find the chlorophyll powder? Question, could we do it with other materials instead of silks? Could we use this process and ingredients to dye cotton onesies or baby Muslim clothes?